Tonight we ballast like never before and photos too! I found that box with the Woodland Scenics stuff inside and this evening I have decided it’s time to ballast the track on my layout. 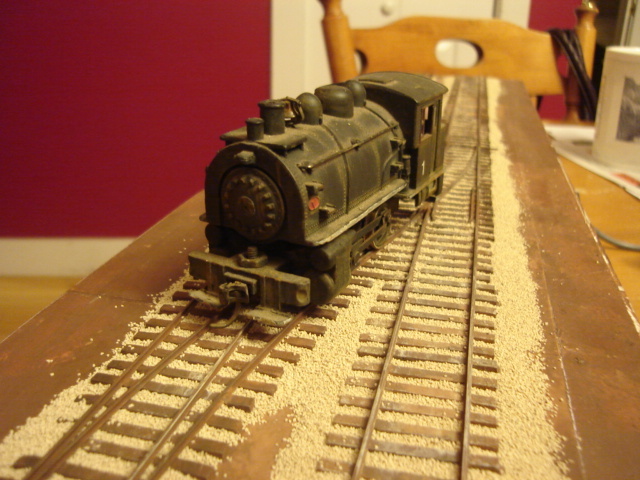 I think we all have some part of the hobby that we just don’t enjoy and for me, it’s ballasting. It’s not so much that I dislike the entire act but more that I’ve had some bad experiences with ballast that didn’t glue down properly or turnouts almost permanently glued in one position (I think we all suffer for that last one right?!). So, I made some tea, took a couple of deep breaths and set to work. The ballast I’m using is from Woodland Scenics. 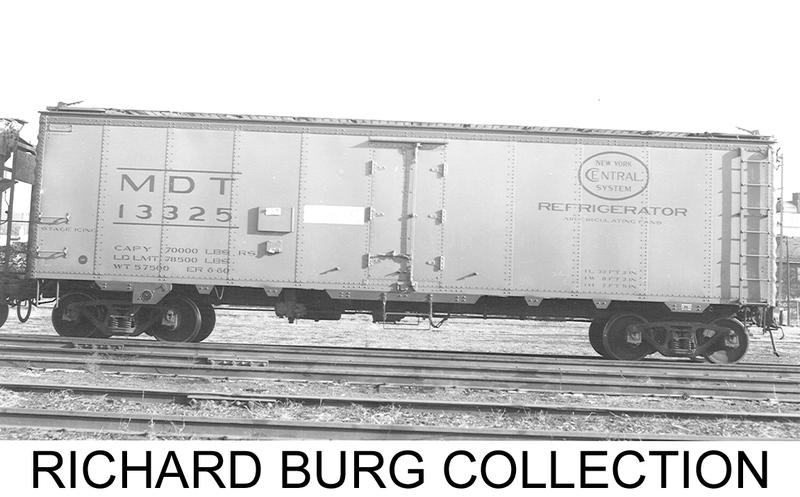 I have their “buff” coloured ballast and their fine grade to get a stone that’s about the right size for HO scale. With a collection of paint brushes and fingers I moved the ballast around the rails and think I’ve actually produced a pretty nice effect for all. Since the layout is so small I just don’t have much track to actually work with and that means that there’s really no rush to get through this. A personal pet peeve of mine is ballast grains on the top of the ties so I carefully worked around each tie carefully feathering it all into place. Satisfied with my handywork I poured another mug of tea for myself and thought I’d just enjoy how nice it all looks. I’ve been promising some photos to update progress so figured I’d break out my camera and take some shots before I wet everything down and try glueing it all into place. 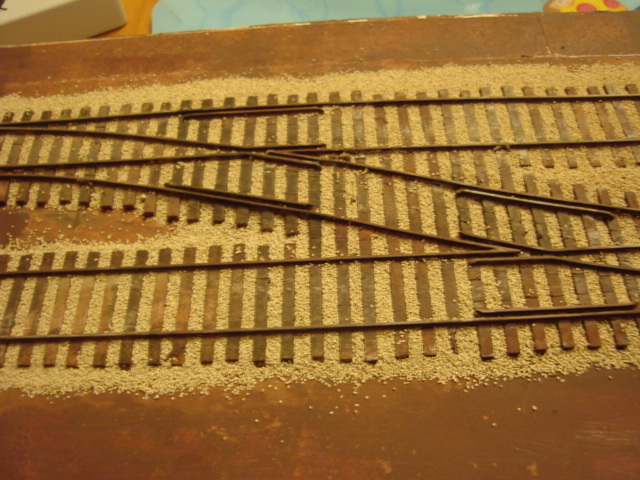 I glue down ballast the same as just about every other modeller does. I first spray a light mist of water over the whole area to lightly wet the ballast. This breaks any surface tension in the glue and keeps it all in place when it’s time to start spreading glue. My glue is the traditional sixty-forty blend of white glue to water. I had an small old glue bottle and find it easiest to just mix the glue and water in this and use the fine tip to drop the glue into place rather than dribbling it off using a brush or eye droppers. Okay, so it’s deep breath time and time to start trying to glue everything into place. If ever there was an event where the whole layout can wind up a disaster I think this is going to be it. Either the glue just doesn’t hold everything in place nicely, or it doesn’t soak in well enough and I get a film over everything. Of course the outlier here is that I’m working over foam core so there’s always the chance that all this water is going to get things to warp. Too late now. I’m glueing. As I write this post the glue is soaking into the ballast. 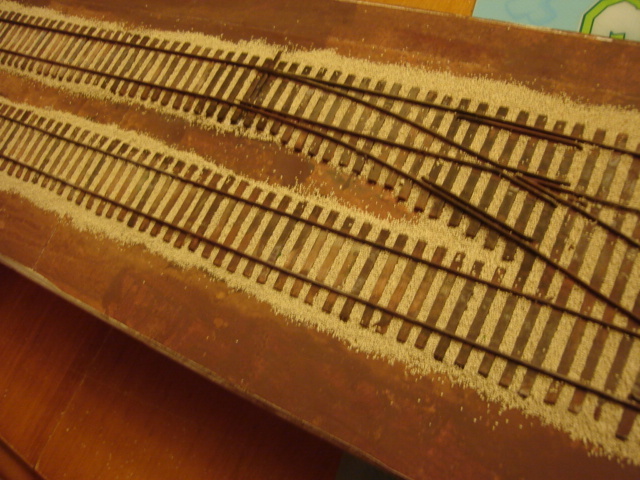 I dusted a little green ground foam along the track edges and have put the layout away to dry. Man I hope this works. ← Happy Birthday GO Transit!